The fourth largest cat, cougar is a marvelous animal. A terrific hunter, cougar is a design in strength and speed. Prowling over a range greater than that of any other felid in Western Hemisphere, cougar reigns supreme as the best individual hunter in the Americas. Though not included in big cats owing to its inability to roar, cougar is a very strong cat with a weight range of 120-200 lbs for the males and 80-130 lbs for the females. 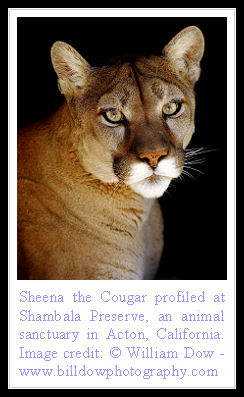 Included in small cats owing to its physical attributes, cougar shares an ancestor with the African Cheetah. Its great bounds of speed along with its long balancing tail are indeed reminiscent of the fastest land mammal, even as cougar masters in stalk and ambush predation. Its great hunting abilities have enabled it to survive in diverse habitats and become subject of folklore in many communities, earning it more names than any other cat, including – mountain lion, mountain screamer, puma, panther, catamount, pi-twal, carcajou, couguar, and cuguacuarana. The coat is of uniform color, typically tawny. Cubs are spotted, but become plain colored as they mature. Patches of lighter color may occur on chin and throat. The body structure is designed chiefly for agility and power. A robust head, powerful forequarters, deep chest and strong jaws enable cougar to be a fearsome predator. The proportionately longer hind legs enable greater bounds of speed along with a leaping ability second to none among land predators - up to 40 feet horizontally! Though capable of generating tremendous speed, cougar prefers to stalk its prey before pouncing on it with few lightning bounds, generating great momentum. Upon knocking down the prey cougar delivers a lethal neck bite – suffocating the animal. In case of smaller prey, the cougar breaks the neck by crushing the cervical vertebrae and severing the spine. Usual prey is deer, though the cat's great adaptability enables it to take a wide prey base – from insects to large ungulates. Conflicts are rare with other species owing to its huge ranges in the wild. Though in certain regions in the north, cougar does compete with bears and wolves for its kills. In the south cougar is outmuscled by the Jaguar, though its versatile hunting ability give it the edge. Attacks on humans are rare and are often provoked by encroachment into mountain lion territory. Staring the cat in the eye and intimidating it with controlled loud noise along with attack by rocks and sticks often drives the cat away in case of a confrontation. Playing dead, as with bears, doesn’t help – the cougar quickly approaches and delivers a fatal neck bite! 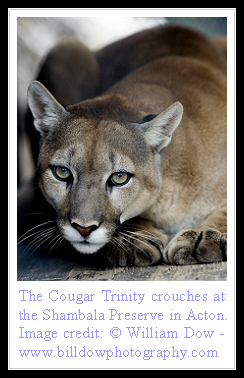 As with other cats, the solitary cougars come together for mating several times a year. Three to four kittens are born, though typically one or two survive in the wild – with the mother doing the sole parenting. The young begin hunting at six months and are capable of surviving independently at one to one and a half years of age. Life span is generally ten years in the wild and up to twice that much in captivity. Despite a distribution from Yukon to Andes in the Americas, cougar’s population is facing a trend towards decline – owing primarily to habitat and prey loss accompanied by predation by their only natural threat – humans. The species is not vulnerable yet though and debate is gaining ground about reintroducing them to the eastern territories, yielding bright prospects for the future of this splendid panther! Just wanted to let you know that Bob has added your blog to my links. Cougars are so awesome. Thanks for sharing this with us... Looking forward to the next Kitty! just to let everyone know, that we have cougers[not the 2 legged one either] living right out side of our small city here in southern saskatwean canada. this i know as a young cub that handnt quite lost of its spots ran out in front of me 3 nights ago. kinda shocked me to see that. these animals are treated worse in america than any other big cat anywhere else in th world. Treated like vermon. Most expansive range and common big cat next to the leopard. yes I am a biologist at the university of washington and cougar attacks are increasing becuase of habitat destruction and because of humans moving into their territory. There are approximatley 3 cougar attacks in a year. firestar doesn't hurt them so they hokay!